A rare Cotswold School oak single two door wardrobe by Gordon Russell of Broadway model 269 (see label in other images)with its original pull out hanging slide. Beautifully chamfered handles. Signed and dated 1928. 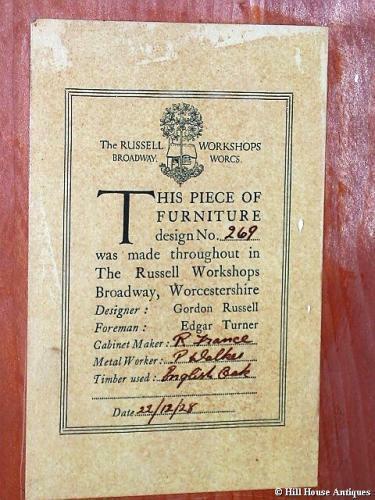 Please see the other pieces of Gordon Russell - a matching single bed and a rare Stow small cupboard and Stow chest. All came from the same household. Approx 66" high, 33" wide and 19.5" deep.